So I know you all probably think I’m a scrooge or grinch from my last post. So I decided to list the things about Christmas that I do like to celebrate this day. First, the one and only Mariah Carey Christmas album with hits like “All I Want for Christmas” and “O Holy Night”. Let’s be honest. Who doesn’t like that album? I actually listen to it year round, so it isn’t technically something I like about the season, but it makes me feel less grinchy. Yes, it’s completely inspirational. Your welcome. I know there was a third thing I like about Christmas, but I can’t remember it now. So that likely means it doesn’t count. So instead I’ll make this caramel apple cheesecake my third thing. I’ve very proud of myself because graham cracker crust and tiramisu are my kryptonite. It’s funny because neither is really that hard to make. However, for some reason my graham cracker crusts would always crumble. But today it worked and that is all that mattered. If I could do one thing differently I would just add more cheesecake filling to balance out the apples, caramel and pecans. Check out the recipe below. (1) Preheat the oven to 375 degrees. Line the bottom of a 9″ springform pan with parchment paper. Combine the graham cracker crumbs, melted butter, sugar and cinnamon in a bowl and stir with a fork until all the crumbs are moist. Pour into the lined springform pan and press the crumbs firmly into the bottom of the pan and about half way up the sides of the pan (or as high up as you can go on the sides). Bake for 6-8 minutes until the crust looks golden. Remove and let cool on a wire rack for 10 minutes. (2) Start the caramel sauce while the crust is baking. Add the butter, brown sugar and heavy cream to a medium saucepan. Bring to a boil over medium heat. Lower the heat and continue to let it boil until it starts to thicken (about 8-10 minutes). Turn the heat off under the pan and let it cool slightly. 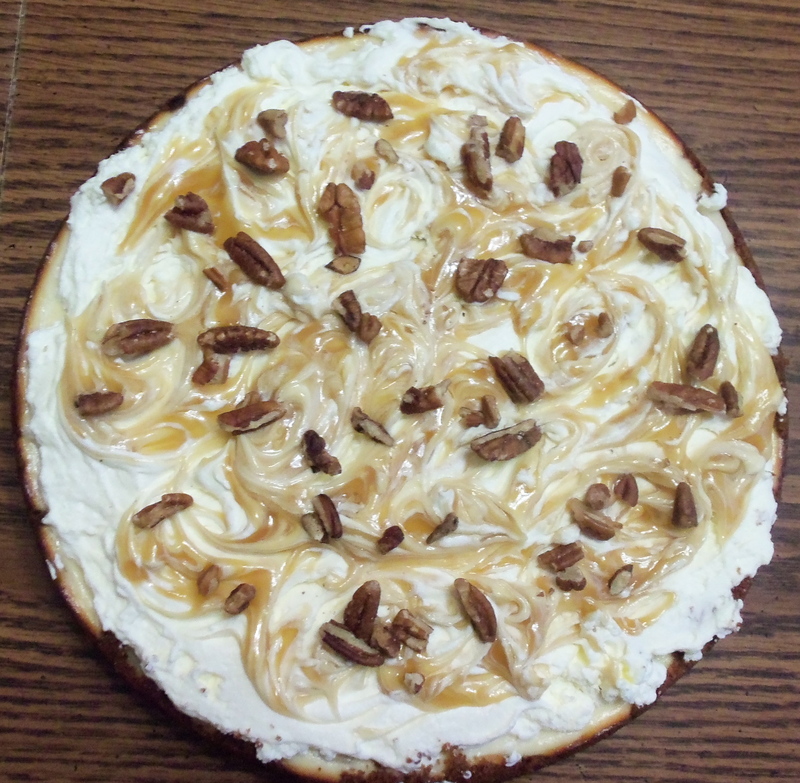 Pour a layer of caramel into the bottom of the crust (make sure you leave some caramel for the topping). 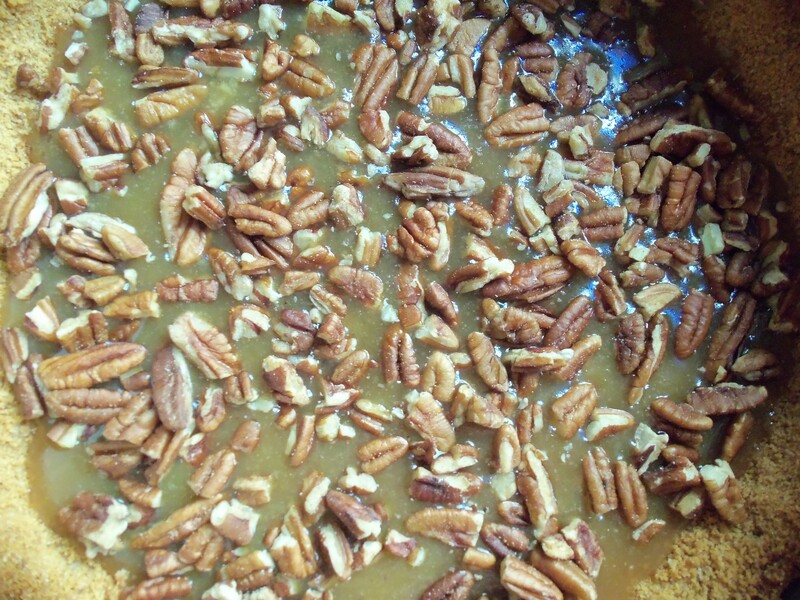 Sprinkle the chopped pecans evenly over the caramel. (3) Melt the butter for the apple filling in a large skillet over medium heat. Stir in the brown sugar, salt and cinnamon and cook for about 1 minute until well combined. Add the apples and toss them to coat. Cook the slices for about 15-20 minutes or until all the apple slices are tender. (Some say the liquid should reduce, but that didn’t happen for me. So with a fork, and after the apples cooled slightly, I scooped out the apples to put on top of the caramel pecan layer, trying to get as little liquid as possible). 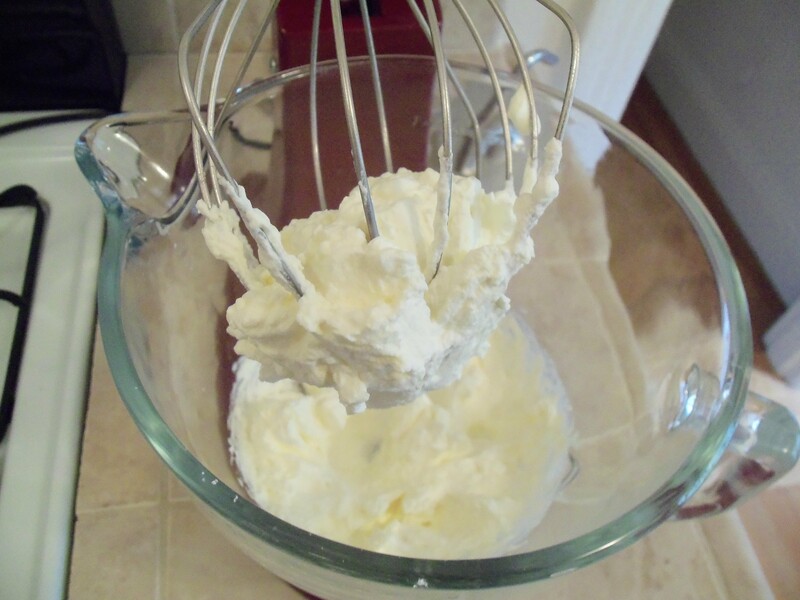 (4) In a bowl of the stand mixer, beat the cream cheese and sugar on medium speed until smooth and creamy. Add the vanilla, egg and lemon juice and well incorporated and smooth, about 2 minutes. 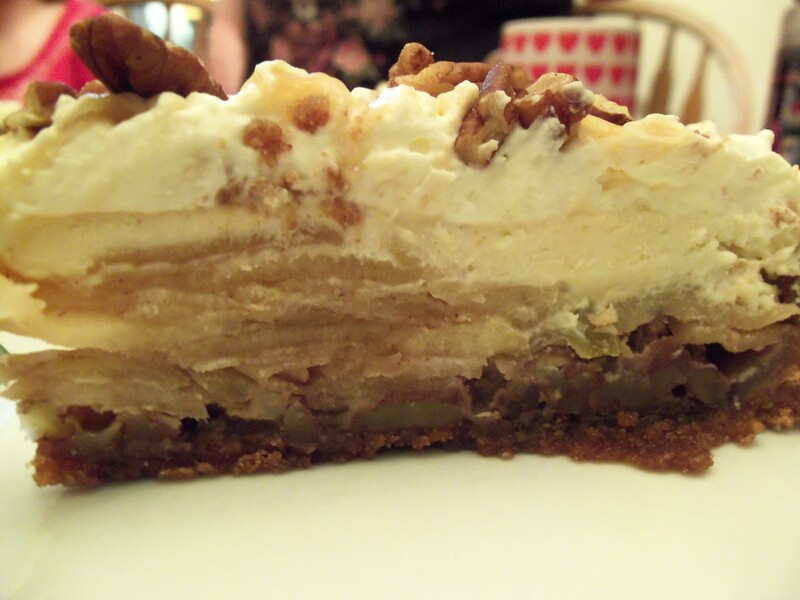 Pour the cheesecake batter over the apples and crust and spread it into an even layer. (Don’t worry, it will be a thin layer. Hence why I would add more cheesecake to this treat, but people liked it with the minimal amount of cheesecake. It’s really a personal decision) Bake for 30 minutes until the cheesecake is set. Put the pan on a wire rack and let it cool to room temperature. After it has cooled, allow cheesecake to refrigerate for at least 4 hours. (5) After the cheesecake has cooled for at least 4 hours in the fridge, add the heavy cream and powder sugar into a mixer with a whisk attachment. Beat on medium speed until stiff peaks form (about 3 – 4 minutes). 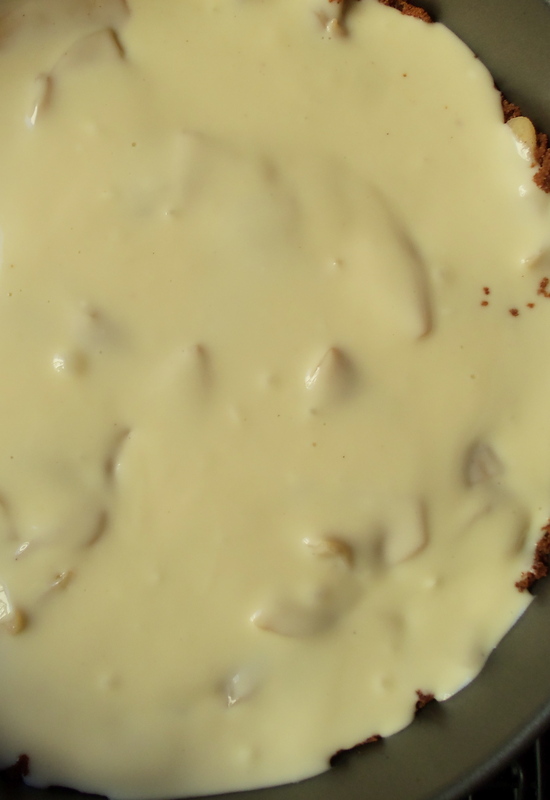 Remove the cheesecake from the springform pan, the spread the whip cream evenly over the top of the cheesecake. 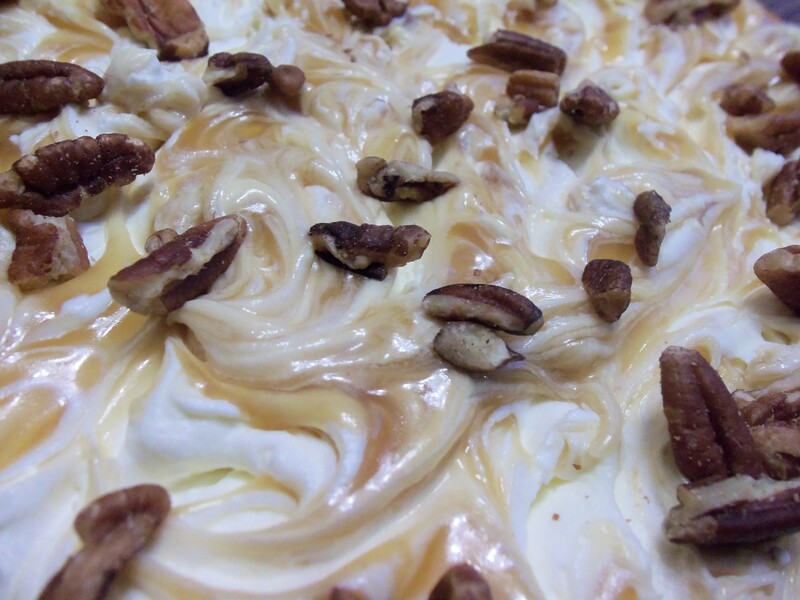 Pour some caramel around the whip cream. Make circles with a knife to create a marble effect. Garnish with the left over pecans. (6) If you are not serving immediately, store it covered in the refrigerator. I should not be looking at this right now. YUM!!!! I’m the same way when I go on the Pinterest food section. I just want to eat everything there!